Later that day we attended the Fia Fia Show, hosted by Chief Sielu. It was a great show about the different Polynesian cultures. Lots of dance, live music, beautiful costumes and talented performers. One of the most fascinating things were to see their intricate Samoan tattoo's that take days to create, and are often very painful to get. They literally hammer or "tap" the ink into the skin with handmade tools. It's incredible. The word "Tattoo" derives from Samoan "Tatau“ - meaning "to hit or strike (ta) with the au (tool)". Three of the men had them all the way up the leg and onto their hips. It is often described as a rite of passage to young men, but also represents their culture and where they come from so it will never be forgotten by future generations. I thought they were beautiful and really interesting to see the detailed work up close. They showed us how to make braided head pieces from palm tree leaves. We drank fresh coconut water, yum! 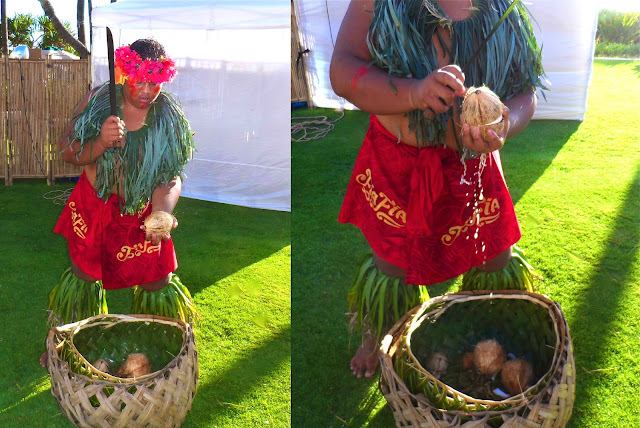 Performances highlighted different Polynesian cultures. That looks like a good show! Fresh coconut water is soooo good. I could go for some right now lol. How long was the show? What a great post! You're my favorite beauty/fashion blogger, because you have the brains and interest to occasionally talk about other subjects than makeup :) Enjoy the rest of your vacation! Hawaiian Luau! Looks soooo fun! I hope you had a blast Annie!